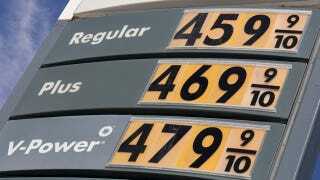 America's summer of four-buck-a-gallon gas has barely started, yet there's some hope afloat that prices could decline soon. Business Insider's Joe Wiesenthal explains why those hopes shouldn't get too high — especially with oil prices shooting skyward again today. — Ed. Oil prices had one ugly day, and already people are openly wondering when they're going to see lower prices. Well, at a minimum it will take awhile before these prices actually filter through, but obviously the bigger question is whether they'll be down significantly this summer. At this point, nobody is betting on that. Nomura's Andrew Lo just put a $110 /barrel target on crude noting increased demand, ongoing supply disruptions, and acute demand from Japan. The loss of nuclear capacity in Japan increases the demand for petro-chemicals, and just today, Japanese PM Naoto Kan announced more temporary shutdowns of nuclear plans. As this chart indicates, OPEC spare capacity — the cartel's ability to lift output — as a percentage of demand is zooming towards multi-year lows. It is nevertheless important to reiterate that while we saw recent prices as having risen above the levels consistent with underlying near-term supply- demand fundamentals, we continue to believe that the oil supply-demand fundamentals will tighten further over the course of this year, and likely reach critically tight levels by early next year should Libyan oil supplies remain off the market. Consequently, it is important to emphasize that even as oil prices are pulling back from their recent highs, we expect them to return to or surpass the recent highs by next year. Here's the rub. Prior to the breakout of the Libyan crisis, oil was already at around $90/barrel (today it's just over $102), so even if the entire Mideast premium came out, we'd still be at elevated levels. The only way oil is likely to decline much further than that is if the economic data got much worse. In that case, gas prices might be much cheaper, but... you'd be more likely to be out of a job, and not driving anywhere this summer. This story originally appeared on Business Insider on May 6, 2011, and was republished with permission.